Yellow Duck Hooded Towel Discounts Apply ! 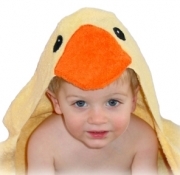 The Yellow Duck Hooded Towel is approximately 30"x54", making it a perfect (and very cute) gift for a baby shower, yet big enough for older kids. Made of 100% cotton, it's great for swimming lessons, the swimming pool, and the beach, as well as bath time!